I think it might be fair to say that Tibetan Buddhism hasn’t often come into direct conflict with other religions. And although I’m all for the harmonious coexistence of religions, I find the few instances of head-on confrontation quite interesting. So let’s look at what happened once when Buddhism and Daoism came to blows. It was in the cosmopolitan court of Kubilai Khan, during the height of Mongol power. There was a new, vigorous school of Daoists, called Quanzhen. The school had been founded in the eleventh century, and by the twelfth it already had 4,000 monasteries and 20,000 priests. The school advocated an inner alchemy which rejected the use of elixirs, previously popular with Daoists, in favour of cultivating one’s inner nature (xing) and life-force (ming). More to the point, they were quite enthusiastic, shall we say, about propogating their religion. During the 1250s, Quanzhen monks were roaming around China taking over small Buddhist monasteries and converting them to Daoist ones. Even worse, they were piling up the sacred books of these monasteries and burning them. They were also hanging around at the Mongol court, like everybody else, looking for patronage. It was here that the Daoists and the Buddhists started to squabble. 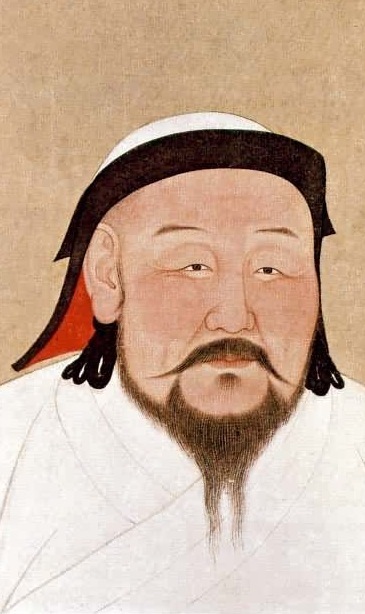 Kubilai’s predecessor Mongke Khan convened two debates in 1255 and ’56 which the Buddhist side was represented by a mysterious monk called Namo. The second Karmapa, Karma Pakshi was at Mongke’s court at this time, and took part in the debate of ’56. These were opening skirmishes. It was in the reign of Kubilai that the decisive debates took place. The monastery-occupying and scripture-burning activities of the Daoists had not abated. And now, adding insult to injury, they were also circulating printed copies of the Laozi huahu jing, a polemical text telling the story of how the found of Daoism, Laozi, travelled to India and invented Buddhism there as a lesser doctrine for the barbarians. Kubilai’s imperial preceptor at this time was Chögyal Phagpa, the head of the Sakya school, and by the Khan’s command, ruler of Tibet. Phagpa was upset by the Daoists’ activities and asked the Khan to convene another debate. This time, the stakes would be higher – the losers would surrender their own scriptures to be burned. We know that this debate really took place in the summer of 1258, thanks to Chinese and Tibetan historians. We also have Phagpa’s own account of it – “Verses on the Defeat of the Quanzhen Teachers” – preserved in his collected works…. And shot by the archer of inspired speech. He believes that the self exists in the material aggregates. For the path to liberation. The name of the Daoist who went head to head with Phagpa is not preserved in any of the histories. A pity, since he was obviously well-known at the time. For Phagpa his first crime is philosophical: since he believes in the existence of a self, he will never understand Buddhism, the philosophy of nonself. His second crime is the pride that has led him to burning Buddhist books. So, who won? Of the excellent yogic conduct of the Sage. Ah, Phagpa won, and it seems his opponent, in the traditional way, converted to Buddhism. In fact, in the colophon Phagpa states that seventeen Daoist monks converted to Buddhism. By the way, did you see what Phagpa did with the metaphors in this verse? Rather sarcastically turning the Daoist tradition of alchemy against his opponent, Phagpa characterises his own Buddhist logical arguments as a kind of alchemy, transforming his opponents iron-like intellect into the golden Buddhist teachings. From archer to alchemist. Spread to the limits of the sky through the realms of men. Or with no path, to enter the teachings. What he doesn’t mention is that the after the debate, 45 Daoist scriptures were burned. Presumably these were the Daoist books kept at the Mongol court. That wasn’t the end of the problem. Another debate was convened in some decades larer, in 1281 (after Phagpa’s death). The Buddhists won again, and this time the entire Daoist canon (except for the Daodejing) was burned. And though that does seem to have been the end of Daoist influence at the Mongol court, it wasn’t the end of the Quanzhen school. They survived and remain to this day the largest school of monastic Daoism. In the past in China, the one called Tawo Shang Lao Jun was born after 82 years in his mother’s womb, and delighted in solitude. Striving for meditative absorption, he attained clairvoyance and magical powers. He gave advice on this path of his to students, and a religious system similar to the Śāṃkhya arose. His followers grew very numerous and came to be known as the Quanzhen school. Seeing that they were doing harm to the teachings of the Sūgatas, the Lord of Men Kubilai commanded a refutation this false system. On the 23rd day of the midsummer month of the male earth horse year (1258), Phagpa, having studied for a long time to achieve expertise in our own philosophical system, defeated seventeen [teachers] who became monks. This has been written as a commemoration. 1. Drogön Chögyal Phagpa. “Verses on the Defeat of the Quanzhen Teachers.” Sa skya bka’ ‘bum: 7.304. 2. Eskilden, Stephen. 2004. The Teachings and Practices of the Early Quanzhen Masters. New York: SUNY. 3. Tao-Chung Yao. 2004. “Quanzhen—Complete Perfection.” In Kohn, Livia (ed. ), Daoism Handbook. (2 vols.) Leiden: Brill. II.567–593. 1. Kubilai Khan, portrait (13th c? ), National Palace Museum, Taipei. 2. 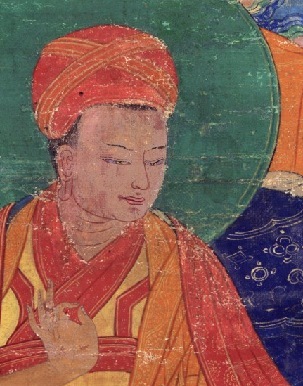 Chögyal Phagpa, 18th century painting. Rubin Collection, HimalayanArt.com. This entry was posted in Buddhism, Daoism by Sam van Schaik. Bookmark the permalink. I wonder how do you explain the Zin-shing in the title of ‘Phags-pa’s work? It’s known from other contexts as meaning something like Daoist, but why particularly Quanshen-school Daoists? Laufer, in his Loanwords (p. 526) says the Chinese for Shingzin is Xiansheng. And he adds that they must be identical with the Sensin mentioned by Marco Polo. It’s times like these when I wish I had mastered Mandarin. And why on earth would anyone identify the philosophy of Laotze/Laozi with the Indian Sāṃkhya (Tib. Grangs-can-pa; not Śāṃkhya) school? I can’t see it. Perhaps some common emphasis on the natural elements? P.S. If you were as lucky as I am and had a copy of the 1987 New World Press publication Bod-kyi Thang-ga’i ‘bri-rtsal / Chos-rgyal ‘Phags-pa’i Mdzad-thang, with the biographical thangkas (Mdzad-thang) of ‘Phags-pa’s life, you could see (on pp. 80-85) the obviously sad and defeated Daoists, already wearing Buddhist monastic robes, seated on ‘Phags-pa’s left-hand side (in the upper scene… in the lower scene they have differently colored robes and black-rimmed red hats). In the text they are called Ta’o-ca’o Chos-pa. I don’t see any scenes of burning books there, and I just hope our hero ‘Phags-pa wasn’t responsible for this. Good question, but to be honest, it just seemed an obvious conclusion that Zin-shing was ‘Phags-pa’s transliteration of Quanzhen. Now I have looked around for some of those other contexts you mention, I see that it is considered by some to represent Chinese xian sheng 先生 meaning a reverend teacher and apparently used for Daoist priests. I must say Xiansheng looks like a better source for tib. Zin-shing than Quanzhen. Oh well. As for the Sāṃkhya connection (and correction – thanks) I think ‘Phags-pa must have seen some similarity in the idea of an abiding essence both external (prakṛti) and internal (puruṣa). Since he makes this connection, he might have used similar arguments in his debate with the Daoists to those used by Indian Madhyāmikās against the Sāṃkhyas. I wish I could see that publication of yours. Sounds wonderful. I knew that Sa-pan is said to have stopped Goden Khan from drowning the local Chinese to keep them subdued, but not that ‘Phags-pa did similar thing. In any case, his elegant style and the simple way he explains complex aspects of Buddhism in his works for the Mongol court make him my hero too. Much more interesting, actually, are the footnotes to this paragraph, with much discussion about the Sensin, but also a significant summary of some still earlier expositions on the Tibetan Bön religion. The justification for this was the suggestion by some that the Sensin might be the Tibetan Bönpos (and others who had suggested that Bön and Taoism are the same, or have the same founder). If you have access to Paul Pelliot’s “Notes on Marco Polo” published by Librarie Adrien-Maisonneuve (Paris 1963), I would imagine he must have a very long and interesting discussion on those Sensin (or perhaps under some other spelling of the name). I often wish I had a copy of this on hand where I am. It apparently does equate Daoism with Bön. In M. Kapstein’s contribution to the 2004 book he edited for Univ. of Chicago Press, “The Presence of Light,” at p. 155, note 37, he calls attention to Le’u-tshe in the Sba-bzhed (p. 14 of the 1980 edition). The passage is a difficult one, but I imagine you would be equal to it. Not that it has much to do with ‘Phags-pa, just that it’s interesting to contemplate those rare occasions when Chinese cultural heroes like Confucius and Laotzu do pop up in classical Tibetan sources. Thanks for so many references. The equation of Daoism with Bon is strange no? Or do you think that there’s good reason to look for some Daoist influence on the early Tibetan religion? Anyway its interesting that in the Sutra of the Eight Manifestations (tib. Snang brgyad, chi. Bawang jing), which was translated into Tibetan from Chinese, the Chinese word for non-Buddhist sorcerors, xie shi was translated with bon po. I’m just paraphrasing Stein’s Tibetica Antiqua I here (see pp.163, 171). Does this mean anything more than that the early Tibetan Buddhists called all heretics ‘Bonpo’? And could this xie shi possibly be behind the Tibetan word Zin-shing? I seem to be in the mood for questions today. Don’t feel you have to answer any of them. I see that sometimes canonical sutra you link to uses the term “mo-bon,” which is used in 12th century Kagyü and Kadam works as well. We don’t know what it means, but I think something like ‘divination’ (mo) is intended by it much of the time. I don’t think it’s especially likely that Daoism, even much less than Confucianism, had much impact on Tibetan culture at any point in history. But I do think somewhere far in the prehistoric past there were certain areal (perhaps also arial?) religious phenomena that were broadly shared in that general part of the world… that could go on to feed into and influence the area’s religions. I certainly agree. There are so many similarities between what little we know about early Tibetan religion (actually, sometimes it feels like we know to much, but nothing for certain) and the rituals of Inner Asian nomadic peoples – Scythians, Huns, Turks, Mongols. Burial practices, oath-taking ceremonies, divination, spirit possession – not just the presence of these rituals but the actual details seem to strongly suggest that the Tibetans – or at least the ones who founded the empire – came from this same nomadic ‘cultural matrix’. I’m sure you have thought about this too. Any studies on Bon influences on Daoism? Just curious. I haven’t heard of any such studies. There are interesting things going on at the places where Tibetans touch on and intermingle with other nationalities. There are some ‘shared’ pilgrimage sites, in which each pilgrim sees things relevant to his or her own religion, while largely ‘missing’ the significance of the same sites to other religions. (Omei Shan, Wutai Shan, Shar Dung-ri in Amdo, etc.) I see possibilities for influences under these circumstances. Daoists see the Kunlun Mountains that frame the northern Changtang as a very holy place. So we could say that there are some Daoist holy places in Tibet, and some Bön holy places in China. Or to attack the question in a different way. Yes, very many Bön sources do believe that they represent a broad international religious movement in rather ancient times that ended up influencing religions all over Asia. There is one Bön scripture (the only one directly used by Thu’u-bkwan in writing, in 1801, his famous anti-Bon polemic) called the Rdzong-‘phrang that was actually rediscovered by an unknown tertön in China that tells about a conference of ancient Bönpo stages from practically every country of Asia during those times, including Zhangzhung, Khotan, Persia, India, China, etc. This is just one example of such a text out of very many. There are lots of studies of Buddhist influences on Daoism, of course. But no, none concerning Bön (or even of Tibetan Buddhist) influences on Daoism as far as I know. Do you know of any? Will you write one? It’s by Hoong Teik Toh of the Academia Sinica, and has the title, “Ch. Qiong ~ Tib. Khyung; Taoism ~ Bonpo — Some Questions Related to Early Ethno-Religious History in Sichuan.” It only costs 10 dollar, so maybe we should order a copy. I haven’t seen it yet. It’s no. 146 in the list. Some of these titles may be downloaded as PDFs for free. As a Daoist priestess, this discussion has been fascinating. I’d like to suggest a few vectors for the interaction of Daoism and Tibetan culture, especially Bon. Certainly such influences must have existed. How ironic that the anti-Daoist Phagpa dates his colophon using the Daoist 60 unit cycles… The Daoist influence on Tibet in the calendar, astrology, 五行 are known even to outsiders such as myself. Given the understandably weighty overburden of the Indian Buddhisms in Tibet, these links are hard to discern in the noise, but I get the sense that the Tibetan-Chinese connection was far more intense and nuanced before the Yuan dynasty. One vector for ancient links is at Dunhuang itself, where Buddhists and Daoists, Han and non, engaged in these traditions in very close proximity. I’m familiar rather well with the Buddho-Daoist dialogs regarding 觀 texts during the Tang; several Daoist scriptures were used as the basis for Buddhist ones and vice versa. But I’ve not yet read an exhaustive study of this, especially as it relates to cultural diffusion out of the northwest. Surely this must have been a major site where Tantrayana and Daoism interacted, as they did throughout China in the Tang-Yuan timerange. Regarding the identification of Quanzhen with Samkhya, this is a very canny observation by Phagpa, and is an argument for this “debate” being something more than a witchhunt. He was obviously read up on Quanzhen Daoist thought, though seems to misunderstand that Daoists regard dualism as complementary and only relevant in the conditional realm. This Samkhya school’s self and matter dialectic sound much like that of the inner nature (性) and destiny (命) theories which are important to Quanzhen. What Buddhists often misapprehend as they engage Daoism is that it’s inappropriate to characterize it in the place of Vedic religion’s affirmation of self. In this case, I can anticipate that Phagpa would have charged the Quanzhen debator with saying the refinement of destiny into inner nature reifies the self. He may also have figured 重玄宗 thought, surely still important to the early Quanzhen, which seeks to refine mind into spirit, body into form, as Samkhya. Both figurings would have ignored the Daoist understanding of the Dao existing as both empty and being, of which inner nature primarily participates with emptiness through transformation (化). As Daoists do not reject contingent, karmic reality, but acknowledge that it is merely congealed out of higher energies, this life affirming stance (even in light of our own native understandings of emptiness) would surely have confused Phagpa, as they often confuse Buddhists today. Daoism is actually a transformational tradition, not a renunciate one. The vinagre tastes good. Thus among the Buddhisms, Daoism typically is especially open to engaging Vajrayana, at least in exoteric tantra. Thankfully the status quo in Buddho-Daoist relations have been more peaceful since the early days of the Yuan dynasty! About the Huahu Jing, this was of course viewed as polemical by Buddhists. No doubt it was used such, and thus its frequent banning was understandable. However, from a Daoist perspective, the efforts of Most High Lord Lao in evangelizing the barbarians thus has also been seen as a hopeful bridge to eccumenism. As Shijkyamouni Buddha was an avatar of Yin Xi, it was enjoined that Buddhism was a holy teaching. This was represents Daoist correspondence or homology, the process of fluid identification that allowed Buddhism to be “read” in Daoist understandings. (Example: Thus we can read the Heart Sutra, glossing the Buddhist nomenclature as correspondences of Daoist ones.) It’s often misunderstood by Buddhists that this form of interpretatio is necessary in the Daoist worldview and has more contributed to eccumenism than it has been used by the likes of the Three Wu emperors to persecute. The Chinese Three Teachings eccumenism could not have succeeded if this kind of correspondence had not been a precursor. Fundementalist Daoisms are much rarer than they otherwise would be without this kind of ontological innoculation. Fascinating discussion, thanks for posting this online. Please let me know of studies on Daoist influence on Buddhism and Tibet, as well as Bon-Daoist interaction.